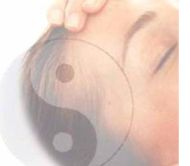 The method of receiving a Reiki treatment from a practitioner is a very simple process. The recipient simply lies on a couch and relaxes. If they are unable to lie down the treatment can be given in a sitting position, the main thing is for the recipient to be as comfortable as possible. There is no need to remove any clothing as Reiki will pass through anything, even plaster casts. The practitioner gently places their hands non-intrusively in a sequence of positions which cover the whole body. The whole person is treated rather than specific symptoms. A full treatment usually takes 3/4 to 1 hour with each position held for several minutes. As running water smoothens the jagged edges of a rock until it is small enough to roll away, Reiki flows to the areas of need, soothing pain and supporting the body's natural ability to heal itself. Reiki restores balance in one's life. Reiki is love, Love is wholeness. Wholeness is balance, Balance is well being. Well being is freedom from disease.